Customizable to fit your own process. Great customer service. If I ever have a question I can just ask and get a human reply with the correct answer shortly after. The automatic scroll right function in pools is mildly annoying. Honestly, if your a recruiter and still using spreadsheets you should definitely try it. I like using it much more than Bullhorn because it's just so much easier to use. Centralized database for candidates as a recruiter. I use a lot of spreadsheets but it's hard to find candidates amongst the growing amount of pages. Breezy makes it really simple and easy to keep track of my best candidates and their current status. I love the fact I can just start typing a name and quickly find the candidate I was looking for in the candidate's profile window there are contacts, notes, resume and a profile overview with links. Perfect, its all in one place! As a startup CEO, I love the free version of Breezy that has helped streamline our entire on-boarding process. I mean, wow. We are on a number of job boards, so I would love to be able to import the answers and resume's from ziprecruiter onto Breezy. I'd also like to be able to customize the pipeline (without paying for it;). The starting price is still a bit hard to swallow for a scrappy startup. I'd like a lower tier that allows for some customization without jumping up to $150 per month immediately. I'd pay $50 for some increased flexibility. We are able to track where our applicants are in our pipeline, upload their resumes (and other docs), and take notes on them all in one space. Even though our candidates come from numerous platforms, they all make their way into Breezy if htye keep moving forward. I love the ease of moving applicants through the pipeline. Being able to drag their application through each stage of the process is so easy. I love looking at the pipeline and getting a general sense of how many applicants we have in each stage at any given time, rather than having to sort through a list or click into each candidate to see where they are in the pipeline. I wish that we could set scorecards for candidates at each stage in the pipeline, rather than compounding them all together each time a new score is added. Even if we could have a final score that totals scores from each round but still breaks out scores for each round, that would be amazing. Definitely consider it! We knew we had pains with our prior workflow but didn't realize how easy the whole process could be until we switched over to BreezyHR. We are managing hiring through BreezyHR for multiple departments at our company. Being able to post multiple positions and manage them all separately but in the same platform is immensely helpful. "Great ATS - Saves a TON of time!" I love the automations, scheduling links and video responses. Some limitations on scheduling links but it's minor. You will not regret it. It takes time to set up in the beginning but it is WELL worth it. The ability to have multiple pipelines and have customizes automations for each is a time saver for us. Previously, I was doing all of it manually on our former ATS. Using the video responses completely eliminated a step in our process and literally saves me days of work, which is huge. Having the video interviews built right into the program is another added bonus. Love the scheduling links that are built in, but wish there was more flexibility like choose a specific date instead of "One week out, two weeks out", etc. Additionally, we usually do unusual length of times for our interviews like 50 minutes or 75 minutes and I'm limited to 15 minute increments and have to take into account the breaks for the interview panel. Small thing to work around but I see benefits in more customization in this area. Overall though, I LOVE this product. "Comprehensive feature set, low cost solution for startups"
Importation of resume attachments and normalization of resume data works very well. Custom questionnaires are also incredibly useful. We use Breezy to track all email threads with a candidate as well. Also internal discussion threads. Basically 100% of our hiring communications are in one place everyone can see. Video interview feature; sort of imperfect. Looking forward to using it when it is rock solid. There are a few systems that are more comprehensive; but they are orders of magnitude more expensive. If you are a startup shopping in the Breezy price range Breezy is it. Instant job portal; almost no effort. We use triggers to step candidates through a sequence of "tests". We build in pipeline stages that a candidate can almost automatically move through so we don't have to pay much attention to the firehose and can focus on candidates that can demonstrate some skill. Breezy helps me stay organized as our company received a plethora of candidates. It is straightforward and easy to see all of the information I need. I love that I can work from multiple views, whether I am looking at all of our positions open or all of our candidates who have applied. And I can filter on the candidates for whatever I need. If I need to find a former candidate, its easy to find as well. The pipeline is hugely helpful so that I can see how many candidates we have and where they are in the process in order to help follow up. It would be sometimes helpful to have more quick clicks in order to do a meeting invite or see information about a candidate. My colleagues are sometimes quick to delete/filter breezy emails so I sometimes need to email them in addition to tagging them to notes on a candidate. I wish you could see the actual dates on the team discussion section instead of just "3 days ago" or "two months ago" so I end up writing in the dates in the notation I put in. It is really fantastic. I have used several other recruiting softwares and Breezy is far and away the best. Managing recruiting. Having a pipeline of candidates and staying organized on the interview and hiring process has been extremely beneficial as our company grows. I just love how easy it is to use. When I was new to the company, I was able to get up to speed on Breezy and start to use if effectively on day 2. "Feature rich, at a minimal cost"
Breezy has done a great job of creating a platform that is incredibly robust for the age of the product. They were very strategic with their feature launches while at the same time not disregarding the need to great UI/UX. Best part is, they keep improving and seem very excited to keep the quality of their product high. As with any relatively new product, there are some bugs with the system. Views could be better optimized for differing screen sizes, stacking of modals isn't ideal, and sometimes a form wont save it you pull the cursor outside of the text input field. On the bright side the support team is always a stones throw away and happy to assist. Give it a try. All the other ATS offerings give free trials as well, we landed on Breezy because we got a chance to give it a go and were really impressed. Be weary of any ATS that isn't quick to give you a tour. It creates a one-stop ATS for companies looking to grow their workforce without spending big bucks. Seriously, there as so many alternatives that are less feature-rich, more expensive, and harder on the eyes. We did our research and l were very happy to land on Breezy. The ease of the pipeline is second to none when recruiting and responding to applicants. Ready to send templates make communicating with all applicants easier than ever. I'm still new to BreezyHR, so there's nothing that I particularly dislike at this point. Please use breezyHR over simply posting jobs to a job board. The ease of reports and separation of each position is wonderful. If you are hiring for more than one position, each job can be administered by all or specific members of the hiring team. The demonstration phone call and web meeting is very informative and I needed no other instruction on how to use the product unless I needed something super specific. Even then, support was very quick to send me the information that I needed. We are currently recruiting a few salesmen, so using BreezyHR makes it really simple to see where everyone is on the position pipeline. The benefit of using the templates is the best. If applied to each section, the templates make it really easy to communicate with each applicant no matter where they are on the pipeline (applied, feedback, interview, hired, disqualified, etc.). There are also so many choices for application inclusion like extra questionnaires and video interviews. Also, if I ever have an questions about specific processes within BreezyHR, support responds within the day usually to give me all of the answers that I need and more. "Gave Heart Back to Hiring"
How easy it was to implement, and how responsive their help team was. We had never had a program like this before and were very nervous. The BreezyHR team made it incredible easy to not only get started, but to dive in. The representatives were always around to help answer questions, and we found that using the programs became common - like checking our email or picking up the phone, it was easy. We also discovered that we could give the hiring back to the people, and not leave to programs. We could let the program take care of the small things, and the things we needed automated, while focusing on talking to people and making sure they fit well within the organization. I didn't dislike anything. I didn't understand some things, but those were all things which I was able to learn more about and gain better control of. Ultimately, the idea going in was that we would not know how to do what we needed to do, and that refining the process was a big change for us. When we started with Breezy, we combated our own innate desire to make things more complicated than they needed to be. Know your goals. Don't just blindly jump into the project of refining your HR process. All of our new hiring needs. We have increased more relevant applications. We also found ways to refine our pipelines and improve the internal process used to gain prospective employees and nurture future ones (ones who could not be hired at the time or who needed more vetting). We found ourselves in a considerably better plan than we've ever been thanks to the program. BreezyHR has a great layout. It is easy to keep track of applicants, move them through the recruitment stages and keep records for future hires. It is a great collaboration tool for our hiring team to be able to review and discuss applicants throughout the process. I also like the ability to email and book interviews directly through this site. BreezyHR allows the interviewer to propose multiple times to meet and allows the candidate to choose which time works best for them. From there, it automatically connects to my calendar and blocks out the time. Lastly, the recruitment analytics area is great! It lays out all of the analytics I am looking for when reviewing our process. For the company home page, you aren't able to remove the "tabs" to "Gallery" or "Current Openings" at the top. It is more of an aesthetic feature that isn't great. This is a great product for any size of business with varying recruitment needs. It is affordable, easy to set up and use, and has great support. BreezyHR is always updating their product to meet customer needs. There are several things to like about this platform. It makes it easy to post jobs in multiple places without hassle, and the user interface once candidates apply makes it simple to quickly review folks and keep the info all in one place. Depending on the way a candidate submits their materials, their cover letter and resume can either appear in the browser window or download to your computer. I wish that all materials would appear in the browser instead of making me download each time, and without warning. The hiring process was cumbersome and lengthy before employing this software. Since we've started using it, the process is more efficient and hiring committees are happier with the outcome. It feels as if a huge burden has been lifted for everyone. "Great pipeline management with easy automations"
I love how Breezy allows you to set up your own pipelines any way you like. It's been really easy to create a flow that fits our particular process and tailor it to fit our internal processes, too. The automations you can add at each stage make it easy to stay on top of tasks and progress. As a remote team, we receive applications from many different zones (and handle them in a couple different ones, too) and the automations also help us respond to candidates in a timely fashion. The interface is easy to learn and use. Overall, very happy with the features and functionality. Additional points for actively working on adding more features sourced from the community of users. There are some things that could be improved, like being able to see all your plan and proposed interview times in one calendar, and being able to incorporate questionnaires within emails, etc. but overall, the software works great for us. Plus, the team is actively working with the community of users to identify and add new functionality, so I can't really complain about much here. Hiring pipeline. Breezy has made is very easy for us to build and manage our hiring pipeline and keep the entire hiring team in sync. "Simple but powerful ATS, improving regularly, with video screenings"
The ability to require video questionnaire responses is the key feature from my perspective. Much more predictive of subsequent interview success than audio recordings. Breezy also does a nice job handling workflow and associated rules-based automation, and recently added the ability to queue multiple emails within a pipeline stage, which is a nice usability enhancement that will eliminate my "follow-up" pipeline stages eventually. The breezy-created job landing page is solid and looks good. Candidates tell me their experience is best in breed, although I only talk to those who did well in the video interview, so that self-selects a bit. Their support team has been responsive, and they communicate new feature releases regularly within the app. Mobile app works fine as well. Candidate scoring features are weak -- there is only 1 scorecard per hiring manager, and answers are scaled 0-2 with a manual overall score from 0-4. I use a separate system to manage structured scoring with 1 scorecard per interviewer per candidate interview, scored 0-10 and with an overall score generated programmatically out of 100 for each interview round. There is no list of job sites that they post to (at least not that I've found). Formatting on postings has not passed through to job sites in my limited experience, but I believe this an issue for most or all ATSes. View tracking back from job sites seems to be non-functional. It reports something, but I'm not entirely sure what. Click-throughs from LinkedIn, for instance, don't match what LinkedIn reports through their management panel. Seems to be somewhat limited job site support relative to industry norms, but I'm not sure that I care about anything beyond Indeed/LI/FB at this point. Maybe Glassdoor, which they also support. Roles and permissions is also still very limited, and doesn't support common business use cases (i.e., non-hiring managers submitting scorecards). Hopefully they'll eventually roll out a configurable role-based model. If you don't care about video questionnaire responses / video screenings, then there are other viable choices I think. But if that's a key feature, I was unable to find anything else at anything close to this price point. Breezy's weaknesses aren't major from my perspective -- I can easily work around almost everything but permissions. I highly recommend Breezy, but it isn't yet the software of my dreams. Breezy enables me to screen more candidates, faster, and to manage my candidate pipeline through a nice visual interface. Video screenings reduce the time my staff and I spend cutting down the applicant pool dramatically, and the rules-based email automation provides the tools for an excellent applicant experience. Customizable assessments also help; for some roles I'll be able to screen meaningfully based on selected responses to questions. We have a very high success rate once we make it to face-to-face interviews, and the rigorous initial automated process is a key component of getting to that point efficiently, and to being able to process a sufficient number of candidates. I'll also use (soon, but haven't yet) the video interview feature to replace what would normally be an initial face-to-face for out-of-town candidates. The navigation within jobs/candidates is very easy and everything is on 1 page/profile that I need without having to go into multiple different screens. It is designed very well to easily navigate from one thing to another which saves tons of time compared to past ATS we have used. I'm not sure there is anything I dislike. Breezy works really well both on desktop and mobile. Add in all the automated functions that actually can be implemented in "real world" recruiting and it's a home run! You can't beat the price with all the features it has. We have increased communication between recruiting and hiring managers and have also saved time by utilizing stage actions effectively and with hiring managers being able to see their pipeline, they have stopped inquiring all the time where we are at with their open position. "Lots of opportunities to customize, at a reasonable price." There were a few things that stood out for me. 1. The ability to send applicants custom questionnaires and move them in the workflow based on their answers. 2. The ability to create custom scorecards to assess them with. (Though this needs a few tweaks to fully meet our future needs.) 3. The ability to tag candidates around expertise and other categories. 4. Their pricing is incredibly transparent and you aren't charged for having more users or jobs. You pay what you pay and it doesn't change as you grow. As a small startup, Breezy has been a perfect fit for us. I reviewed 7 other major products, and came down to this or greenhouse. We went with Breezy, both due to the price, and the User experience. They're also great about advancing user feature requests and have been super friendly with every interaction. Building a recruiting pipeline that is trackable. We've been able to build a far more organized recruiting system that allows us to save time in communication and lay down a consistent applicant tracking process across all the departments. The level of customization at that price point has been fantastic. "A bit overwhelming at first, but a great resource"
BreezyHR has been a fantastic way to organize our incoming resumes and potential hires. It gives great visibility into the hiring process, so even if we are not the ones interviewing, our team can still see where applicants are in the process. I dislike that it's not as intuitive as I'd like. For some reason, I've had difficulty figuring out exactly what a candidate has submitted. The layout isn't that complicated, but for some reason, it has taken me longer than I'd like to admit to figure it out, even though I'm fairly tech savvy. It's a good tool when multiple departments are hiring. It keeps things neatly organized, but I would recommend taking some time to walk through it and really understand where everything is located. It'd be great if BreezyHR had some sort of video tutorial for an overview. As a growing business, we need to evolve with our size and BreezyHR has been a great way to give all departments insight into the hiring process. It also keeps everything neatly organized, instead of needing to search through numerous emails to find or share a resume. "Powerful, yet let's you get up to speed super fast without pre-planning everything"
Easy to use and easy to get started. While it is powerful it can be set up quickly and adjusted as experience is gained. We got it running in days and were able to handle 2.5 our normal applicant load because it automated so many stages of the process. Interoperability--although it is possible that we just haven't figured this out yet, and I believe there are more API and custom field options at the top pricing tier. As it uses google services it does not work in Mainland China, but not a deal-breaker for us in Macau. Recruiting international teachers. And it worked perfectly for us. Few if any feature requests I would submit. "Easy To Use, Powerful, Game Changer"
Hiring is like a funnel of candidates that need to be filtered down through your hiring steps to find the very best qualified candidate. Breezy’s tool makes it so easy to do just that. It has a great UI that a non-tech person can learn on the fly, and what I love about it is that it keeps the funnel process collaborative and transparent. Seriously, use this tool, it’s awesome. Seriously, you should stop wasting time and signup: https://breezyhr.grsm.io/A6NeKWAvd4 (And no, I don't work for them, just a huge fan of their tool and how it's impacted and streamlined our hiring process). The support is a little lacking, but not in the best quality (they use Intercom), but to their credit, I haven’t needed to contact them much. The software makes it extremely easy for me to see at a glance all of the applicants for a position, move candidates to different stages, and automate actions like sending out emails based on templates when a candidate moves to another stage. Navigation between various candidates is not very good if you have one open. When I have a candidate profile open, there's no easy way to move to adjacent applicants without closing the profile window. We are streamlining our recruiting and interviewing process by using 1 tool to track candidates throughout the entire process. We've saved a lot of time by using this tool because all candidates are routed through Breezy no matter where they see the job advertisement. Breezy is free for 1 job posting, and we are also saving money. We are able to syndicate our job posting out to many free job boards and could also pay for additional boards if we wanted to. Our business is unique in that we recruit nationally for a variety of Hospitality & Tourism roles... and then invite our employees to relocate 6 months at a time with our Placement Partners / Host Locations. We have been able to custom-configure Breezy's automated features to speed our Candidates through an extensive paperwork process, while ensuring they know exactly what is expected along the way. Having a variety of Stage Actions, triggered by the functionality of Questionnaires has been vital to easing our manual processes. Breezy Support has been tremendous in working with us to adjust settings and correct minor details as we go. The only feature we would benefit greatly from that isn't available (yet!) would be to merge duplicate applications into one file, rather than simply referring to "other applications" by a single candidate. Breezy is elegant and simple to use. Features are versatile, and with effort to set up options to your liking, it provides a powerful tool to expedite recruiting. The Support Team is eager to answer questions and offer guidance on use of features, and the Development Team is open to discussions about potential feature requests. I've enjoyed the exchanges with them, and feel that BreezyHR is the right tool to keep our business moving steadily forward. Our process is paperwork-heavy. Breezy Questionnaires and eSignature documents have allowed us to automate much of the manual processing, saving our recruitment team hours every day. We are processing more viable candidates in a much shorter timeframe. "Made our Recruiting start so much easier! " 1. Having professionally written Job descriptions automatically generated for every role, which saved us several hours/days at least and helped us get up and running in just a couple of hours. (Incidentally in at least 2 cases these rather specific JDs helped us notice we had mis-labelled the role allowing us to correct it in time). 2. The plug & play Career Portal that was super easy to set up & customize for our website. For such little effort on our part, it looked great! 3. Customizable pipelines for each role - complete with customizable email templates and stage actions for automation. This saved us a lot of time as well and it's just really convenient not to have to email everyone separately when you have 1,000+ applicants for a single role. 1. The Questionnaire options provided are a bit too simple. I wish they could allow for more elaborate question structures. (We for instance decided to use a chain of Typeforms for this, which allowed us to go deeper with our questionnaires - perhaps Breezy should consider a Typeform integration so we don't have to leave the platform to do this?). 2. While the threaded email communications with each candidate are quite convenient, it seems that this messaging does not allow me to see something that an applicant forwards to us in the course of communication (for some reason it only shows what the applicant types, which is rather irritating at times). We're using breezy as an ATS to track, test, score and communicate with the 1,500+ job applications we have received over the past 3 months. I love the visual layout of the hiring aspect of Breezy. It is very functional and easy to keep candidates organized. The communication tool for correspondence with applicants is very user-friendly, too! That our company is limited to the number of positions we can have posted at a time (we have a free-level account). However, I understand the business side of this and it's not necessarily a bad reflection of the Breezy platform in any way. There are certain types of positions that have saturated markets right now, such as UI/UX jobs. Due to bootcamps such as General Assembly, that literally misdirect their alumni to be very deceiving in their resumes and portfolios, we get an insane amount of applicants for UI/UX job postings that aren't actually qualified. Breezy helps us sift through these quickly and efficiently. I can move an applicant from "Applied" to "Disqualified" stage very easily. "Breezy helps me organize the recruiting process in an orderly manner and delivers great results"
As the Managing Director of our company, I have 10 positions to fill this year and I want every candidate to experience us as a professional firm with respect for people. At the same time, I want to collaborate with my co-workers on hiring new colleagues. Impossible for me to do all interviews myself. Breezy does all of this for us and has a lot more to offer. "Our girls LOVE IT. Automation and ease of use is superb." Would be great to print Questinnaires as a PDF. We often do on paper "graphology/through patterns" analysis. We do not always have access to the second monitor out in the back yard, when analyzing a lot of data. Great if you have multiple teams. We have Local and Global team. You can create multiple job boards and keep tons of data under account. We got setup in a day, and moved in from another system (20+ Positions+10 years of applicants) in less then a week. Pre-screening applicants well before we call them up, eliminating unqualified applicants, automating Recruitment process. Integration with BambooHR, sending an offer letter...they really have it put together, which is amazing. "Game Changing Applicant Tracking System"
* adding cc/bcc to automatic email actions. I looked at a lot of other solutions, but Breezy really stood out, their support is also amazing and the platform can be customised to whatever your needs are. Check it out, it works well for us. Improving our recruiting process, increasing the ability to manage with high volume of applications. Providing a good experience to everyone that applies to a position, regardless of them ending up being hired or not. "Good resource for HR Practitioners"
User friendliness and interface. The interface is quite simple to use. Someone without any technical background can use it. Notifications from Breezy are also easy to track and it is easy to respond to queries from applicants. It also facilitates team discussion and has very robust collaboration tools that make it very easy for hiring teams to communicate and discuss various candidates on the platform. Breezy's scorecard also enables scoring various candidates to be very easy. Too many emails from Breezy support team requesting for rating and other things which can sometimes be a bit annoying. Also, rather than having the questionnaire under the experience tab, they should just put it under Questionnaire results or something similar. For first time users, it's a bit confusing to have it listed as experience as it takes them a while to adjust to the fact that experience actually contains the questionnaire results. Also they could have cover letter appear in a different tab rather than having it appear under experience as well. It makes the app look really bulky. Quite a resourceful application. Easy to use and easy to implement. Would highly recommend it to organizations that are doing mass recruitment as it is easy to use. As a company, we have been able to simplify recruitment and also streamline communication between our team due to Breezy's collaborative tools. We've also found it easier to assign various people in our team with tasks. "Easy to get started, lacks many features of bigger ATS systems." Breezy is a fairly simple to use ATS. The funnels make sense, 30 minutes and you know your way around the system well enough to get started. It's good for small teams. Limited functionality, ugly UI. Doesn't pick up referral sources well. When you have a lot of jobs or distributed teams, it gets messy. I don't like that it displays photos from Linkedin, feels like it makes employment bias easier. There's a lot of new competitors on the market worth checking out before settling on Breezy. It's an easy to use, almost turnkey solution for small to medium ATS needs. Less expensive than many of the big players on the market. Interactiveness ability, visible pipeline, Real time feedback from the system as well as the fact that i can view the entire profile of a candidate. It also allows several team members who are involved in the recruitment process to have access at the same time. It will provide you with the opportunity to keep track and follow through the entire recruitment process. Additionally, it will accord you the option of running several jobs adverts concurrently. More over, the ability to be able to interact with other team members who are geographically dispersed is a plus. Ability to interact with other team members who are involved in the recruitment exercise real time despite the geographical dispersion. "So much easier than other solutions"
It's been super simple for myself and my colleagues to get up to speed and become power users. We've really streamlined our process over what we had before. The newly revamped analytics & reporting are amazing too. So much great info. Lastly, our candidates love it. We've never had candidates comment on the tool we've used before but they seem to really enjoy the experience of working with us via Breezy. Until just recently the analytics left something to be desired but that's been addressed and then some. Be sure to leverage their integrated email & scheduling functionality. It's a huge time saver. Oh, and the video assessments save us a ton of screening time. We do a lot of hiring so we're constantly looking for more efficient ways attract, hire and onboard new employees. Breezy has been a breath of fresh air for us, right down to background screening and new hire onboarding. "Makes it simple and easy"
I like being able to see how long we are taking in each stage of the hiring process through the Time in Pipeline feature. The layout and colors of the website are also pleasing to the eye and I like that you can do multiple actions from a candidate's profile - send them an email, arrange a meeting, ask your team to submit scorecards, etc. The best feature is probably that Google Calendar can be integrated into scheduling interviews with coworkers. When you schedule an interview with a candidate, you can view your coworkers' availability directly through this feature. Additionally, the email templates (e.g. Set Up Phone Screening, Reject, Technical Phone Interview) are very useful for saving time, and combined with scheduled emails, makes it a no-brainer to use. There are occasionally some glitches in the system where a candidate did not receive an email I sent through Breezy. I would follow up with them through my own email account and the candidate would say that they had not received any Breezy emails. Additionally, I often have to manually fill in candidates' names and contact info when uploading a resume. It should input that information automatically, but it doesn't always work. Make sure to double check if emails have sent, and assign positions to different people so actions are not duplicated. It's easy to organize candidates through Breezy and quickly figure out who needs to be contacted and who has already been scheduled. When each candidate is in this data base, it makes it easy to visualize what needs to be done and how quickly or slowly we are moving. We have been using Breezy HR for about 6 months now and it has definitely streamlined our process immensely. We are quite a small operation and started out with the free version. Soon we upgraded to the basic and it has been working well for us. The email system is great and they have recently introduced a reminder system which is wonderful. When you create a copy of an applicant, none of their documents, email history, team discussion, etc are carried over to the new (copied) version so you will need to move all the attachments and any important information manually. The reporting system is also very basic and not customizable. This is somewhat of a basic system so if you have a very high volume of applicants or often switch applicants from one position to another, this may not be the software for you. Also, if an applicant applies with multiple attachment, Breezy's built in "auto-disqualification' will kick in and move them to disqualified. I confirmed with the Breezy team that this is as designed and there is no current way to turn this "feature" off. We often request multiple attachments so we have to keep a very close eye on the disqualified stage to make sure high potential candidates have not been incorrectly sorted (as of October 2017). This is incredibly frustrating at times. Much easier to keep a visual on the process and status of each applicant. "Forget the messy sheets and candidates lost in their process. Breezy keeps it under control for you!" Automatic mails by just dragging a person from one stage to another! I find it very useful to keep control of many positions at the same time. Using breezy you don't have to worry anymore for forgetting the status of a candidate, it even saves you disqualification calls, by sending automatic e-mails to all candidates in process to let them now what's their status. It's practical, user friendly and very useful! I don't like that i can't connect my corporate e-mail, my gmail address make emails look less professional! Also, i would like it to have another "version" or adaptation to other processes besides recruitment. In my personal experience I've been in recruitment for several years and for this parte breezy is awesome! however, now that I'm in charge of a different area (training) i found it more difficult to keep control of my trainees using breezy as it's no longer a HR process. If you have a hard time controlling a lot of different positions at the same time this is the best tool you can find! It will help you to keep updated every candidate with all their documents in order, it will show you exactly in which stage of a process the are, automatic mails, meeting schedules, evaluation, pre screening, etc! Just try it now! All of our internal processes are in control now, we have, control of all of our candidates, we can automatically schedule meetings with them, and there's no more excuses like "i never received the information, or the email." We have everything under control , and updated with a clic! i't awesome! "Easy to use, saves a lot of time"
- Being able to manage all email comms with applicants from within the HR system. Styling could do with some work - find if you've got very good vision but the trendy small grey font is difficult to read with my 48 year old eyes. Resume appears on the Resume tab, in work experience and also as an attachment. Could do with rationalising the UI a little to present a single LinkedIn-style snapshot view. Make sure you use the integrated email feature. I probably need to start using the tasks & scheduling features! We don't have a dedicated HR resource to handle applicants and comms, so it's very useful to have some automation in this area. Managing CVs, application forms, meeting notes, emails etc. from applicants is a chore which Breezy collects into one place and can even automate completely. "Flexible product and amazing team responsiveness"
1) easily keep our own backend systems in sync with Breezy and vice-versa. There have been instances where bugs in the Breezy software have prevented us from creating optimal workflows. However, they've always been addressed promptly and their responsiveness has been phenomenal. We needed a better way for sourcing and managing qualified candidates. Breezy has helped us on both fronts through their integration with most major "job sites" and their ATS features. Since we started using Breezy, our account managers have been able to increase their productivity and service more roles. In addition, the Breezy reporting features give us more visibility into progress and campaign performance. "Easy to learn & great for applicant tracking"
Breezy is extremely easy to set-up and get started. I had 25 applications within 24 hours for a part-time accountant position! Very simple to move candidates through the stages of the recruiting process. This may be in the set-up, but I have not found it yet. An automatic email is generated when someone applies. That is great! But when I move someone to a Rejected status, I have to push the email. A small step that I would like to automate. We have compared Breezy to other solutions and have found this one to be top-line. Do your research, but you will likely select Breezy in the end! Recruiting for hourly and salaried associates. Breezy has provided many applicants in a short time frame. You still get good candidates and bad candidates, but they are easy to sort through and quickly focus on the best candidates for next steps. "Easy to set up, great attraction tool and sourced new team already"
The platform was easy to set up and saw us live with our roles being promoted within a matter of hours; with a seamless - very on brand - recruitment attraction website, clear application channels, simple to promote to free channels and video questionnaires. All of this resulted in us sourcing a strong field of applicants who we knew were serious about working with us. In all honesty, there has been nothing we have disliked about the product. We use BreezyHr for our recruitment. Using the video questionnaires has definitely reduced the (unwanted) volume of anyone applying and ensures we gain applications from people committed to working with us; this also enables us to assess candidates before progressing to the next (often the first in usual instances) stage. "Great product, very intuitive, works well!!" The automation available between stages, and the e-references options. Automation allows applicant to move to another stage after completing a questionnaire or to receive an email once they enter a stage. Also, the e-references are amazing because it saves hiring managers time on calling those references! The reporting could use improvement. There’s data that goes into breezy that isn’t possible to report on or pull out even in a .csv file. We didn’t have an applicant tracking system. We were tracking everything in spreadsheets, and in multiple places. Not good. We missed a lot of folks and a lot of applicants slipped through the cracks. Breezy helps us catch all those and track where they are in our hiring process! "Unreal automation, the real secret sauce"
Like excel, breezy is limited only by how much work you put into it. Lately, we have been pushing the system with thousands of applications for hundreds of jobs and eliminating most chasing of documents, scheduling of interviews and much, much more. Like any flexible system with multiple moving parts, the demand for new features is fierce. While support is always responsive and positive, it can take some time for a complete upgrade. They are pretty receptive though and love new ideas. pay for the implementation customized solution unless you have months to customize. Able to consolidate most of our systems down from 12 unique programs which didn't communicate with each other to a third of that. More to come. I have worked with a ton of these, and breezy offers the most for the least. Its just that simple. The automation of communication has saved our company countless hours and headache. The support team at Breezy is always so helpful! Simple design that allows even the basic of users to accomplish major tasks. Job postings are hard to find on the sites that are free. I wish there was a link to send you to the job posting on the free site so you can make sure that it is still active. On-boarding 10-99 contractors was a painful process before. Now we have a pipeline step for everything the contractor needs to do with automated communication. This solves the need to hire someone full time to just handle this process. Breezy allows for comprehensive reporting on all pipeline, candidates and views of you job postings which leaves the question of " are we getting views" off the table. "Good ATS for recruiters, especially if you're recruiting high volume"
I would like to have the possibility to set for each role/stage if I want to run stage actions or not. Especially if I want to add a personal message, I am e.g. enabling / disabling the email stage action several times. Would be a lot easier if there was the "running stage action yes / no " button that comes on manual import for every action / the possibility to switch that off completely of course if you don't need to check every time. "Effective and simple end-to-end recruiting system"
It's easy to use! I like that I can easily create groups, talent pools, post jobs, etc. The UI is good too. The support team has been super responsive and helpful too. I'd love to be able to change a pipeline once a job has been created (eg. removing a stage). The candidates UI has room for improvements. Some other similar tools do better web crawling for applicants information. Resume parsing often ends up with some errors such as having the position in the name field. Manage all our recruitment process through a single tool. "Breezy helps to figure out what's going on a lot"
Hmm... Well actually the only thing I can say here is that you gotta create a vacancy (or a pool) before adding candidates, and join each candidate to some vacancy. But it also can be a plus, why not. "Breezy is indeed a breeze to use"
We used Breezy to go from 3 to 30 people in the last year and we are in the process of posting 100 new jobs on Breezh as I write this review. We love the Kanban board design, as it is super easy and intuitive to use. The feature set has grown rapidly over the past 12 months and we don't want for anything. We used the product pretty early on, so we experienced some bugs in the beginning. But support is super responsive and we have seen many of our our suggestions and recommendations implemented in the time we have been using it, so they are definitely building what their customers want, need and request. Easy to set up and easy to use. Reasonably priced. Saves huge amounts of time compared to managing applicants with spreadsheets or paper. Utility for including other employees in the process is great. Allows us to concentrate on the important aspects for candidate assessment. Has substantially improved our hiring process. Emails that do not originate in Breezy are not captured in the candidate records. My CRM program (ZOHO) has this functionality and I wish Breezy had it too. I also wish you could edit scorecards without losing the information already on them. Breezy helps us be consistent in our assessments, by making it easy to separate the subjective from the objective. The automation of emails save lots of time. It is powerful without undue complication. Highly recommended. SO easy to use! I love that everything is in one place. I'm able to have the job description/email/status updates all in one place. It is also a plus that EVERYONE on the team can access candidate and profiles and we can all add details if needed. I also like that I can parse over a LI resume into Breezy. It acts as a good place holder until I can talk to the candidate and get their most recent resume. It would be AMAZING if Breezy linked/talked to LinkedIN! It's so helpful to have everything in one place. I don't have to go back and forth to my work email to find job descriptions or details on the position- it's all in Breezy! "Breezy revolutionised the way we recruit." Breezy has made it easy for multiple team members to collaborate on a recruitment process, and have taken away all of the uncertainty of finding the right people with their targetted advertising channels. They also massively reduce the admin that is normally associated with a recruitment process with their user friendly + automated software. I honestly don't have a bad word to say about them - and regularly tell them this! They have taken all of the pain away from what is usually a painful process. Time associated with recruitment + reaching potential candidates. You also get to see insight into your job description and how well it's landing with the market. Once you invest a few minutes to familiarize yourself with the UI, you'll really start to realize the benefits. You can move quickly and get automatic actions to happen in parallel so you're always moving the ball forward. The video and assessment functionality is very good. And this part is actually really easy to use on the reviewer side. It's not the most intuitive interface. It would be even better if people could figure out how to maximize efficiency without needing training. The main thing for us is moving candidates through the application process, but we do use the video and assessment features. Breezy allows us to successfully hire with minimum distraction from our core business. We are a small shop, hiring 1 - 2 positions a year. When it's time to open a position, 15 minutes in Breezy is all it takes to get qualified applicants to start appearing in our funnel. We distribute the task of qualifying applicants across team members in Breezy which makes it easy for them to quickly vet applicants and get back to their regular tasks. Historically, we spent thousands more with other services without the ease of use and quick results. Breezy just works. Breezy fits our workflow perfectly; there is nothing we dislike. Breezy allows an organization without a dedicated HR department to efficiently, EFFECTIVELY grow our team. Customizing the tool was very easy. It's a slick user interface, which meant I wasn't wasting time learning how to navigate a new application. I love the embedded chat and e-mail features. It helps cut down the noise in my business e-mail, so I can either specifically focus on talent acquisition or the many other facets of my job. The scheduling feature is tricky. When providing multiple candidates available interview times, the tool does not automatically check if another applicant has already selected a particular time slot, so double and triple booking can easily happen. Don't wate your time with other applications. I've already done their demos and Breezy surpassed them by a mile. II am able to post on multiple job boards with a single entry and tracking the applicants on the dashboard means I'm not scrambling to remember which applicant applied through which site and what my last communication with them may have been. Applicants video record themselves answering some basic interview questions which gives me a feel for their communication skills and personality before I decide to meet with them in person. Because I can watch the videos during off hours, I'm able to accomplish more during the day than ever before. "Well Designed and Easy to Navigate"
I have used a number of similar platforms. I like Breezy the best because they have all of the features that I need. When I wonder if they have a certain feature, I check into it and it is already designed and integrated. This is a well thought out and well tested platform. I do not dislike anything about the platform. They have a trial and they communicate well if you have questions. We found this very intuitive and while we did not use the video software, we are excited to work that in to our process. 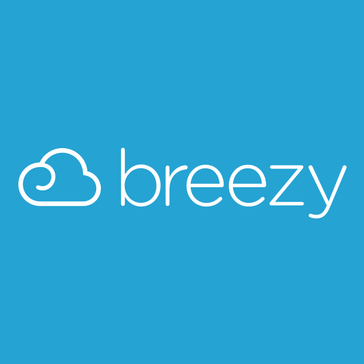 We use Breezy to advertise, shortlist, set up interviews, communicate with and track applicants. * We monitor all BreezyHR reviews to prevent fraudulent reviews and keep review quality high. We do not post reviews by company employees or direct competitors. Validated reviews require the user to submit a screenshot of the product containing their user ID, in order to verify a user is an actual user of the product. Hi there! Are you looking to implement a solution like BreezyHR?